Defencmean Jake Muzzin was undoubtedly the star of Monday’s 6-1 Leafs demolition of the Anaheim Ducks. 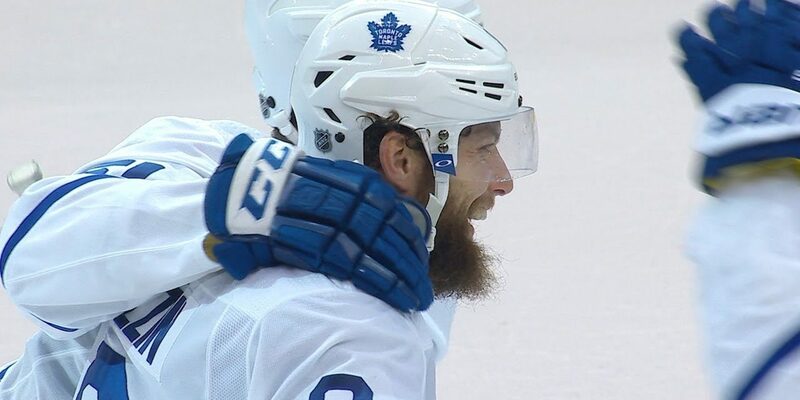 Muzzin had his first three points as a Leafs, one goal and two assists, as Toronto won its second game in a row. Muzzin started off a wild sequence late in the second period with a thundering hit on Anaheim’s Corey Perry. The check drew an unnecessary retaliatory cross-checking penalty to Nick Ritchie. On the ensuing Leafs power play, Muzzin wired a slap shot past goalie John Gibson with less than three seconds left in the frame, extending the Leafs’ lead at the time to 3-0. “Just another hit. I was just trying to close and force a play before the blueline really and sometimes the hits are there and sometimes they’re not. When they’re there I’m going to try and make them and when they’re not, I’m not going to force it,” Muzzin said after the game. William Nylander notched his second goal of the season, finishing a two-on-one with Connor Brown. John Tavares, and Brown, also scored for Toronto. Frederik Andersen made 24 saves in net. The Leafs’ depth on the forward lines was evidenced by the six-goal output without a single point from either Auston Matthews or Mitch Marner. That Leafs goal song “You Make My Dreams” by Hall and Oates is getting pretty stale, isn’t it? Rob Del Mundo is the author of Off The Post, and is a regular columnist at TMLfans.ca. In 2016, Rob wrote “Hockey’s Enforcers: A Dying Breed”, now available at Chapters and Indigo stores everywhere. Join our daily Couch's Corner news and views email list!